When Homewood Mayor Richard Hofeld fell into an icy pond while rescuing one of his beloved dogs at Izaak Walton Nature Preserve in December 2017, the incident had a happy ending. A passing jogger called 911. The mayor was rescued, suffering from hypothermia but otherwise unharmed. His dog, Annie, was rescued. A new event on Jan. 12, the Mayor’s Arctic Dip, will commemorate the mishap and benefit the South Suburban Humane Society. But the ending could very well have been different. On Dec. 16, a 26-year-old Chicago man died rescuing a dog from McKinley Park Lagoon in Chicago. In 2012, a Homewood man died after falling through ice at Izaak Walton. The 2012 incident prompted local emergency responders and preserve officials to begin working on improved safety resources for the popular trail system. One step in that direction was implemented earlier this year when the Homewood Police Department purchased 21 water rescue throw bags to place in every police department vehicle, according to HPD deputy chief Denise McGrath. “The bag contains a 75-foot rope that can be thrown into the water and used to pull a person to safety,” she said. She noted that the bag floats but will not support a person as a floatation device. The bags were put into service in May. Homewood Fire Department also prepares for ice rescues as part of its regular training program. In February, the department hosted a training session on the frozen Dolphin Lake. A number of neighboring departments spent three cold mornings practicing the procedures for rescuing a person who has fallen through ice. Assistant Chief Steve DeJong said the exercise was planned before Hofeld’s accident. It’s a skill area firefighters rehearse when weather conditions are right. Even before the mayor’s mishap, preserve officials were working with HPD and HFD to implement a new emergency trail marker system. Izaak Walton President John Brinkman said the project had been under discussion for several years, but in 2017 board member Gerry Tienstra met a local Scout, Nicole Riley, who volunteered to help install the markers as part of her work to earn a Boy Scouts of America Summit Award. During the warm months of 2017, Riley led the development of the new marker system. The village provided materials. The markers were in place by fall, well before Hofeld’s accident, but the system wasn’t fully implemented. HFD and preserve officials created a map of the markers early this year so emergency responders can quickly locate specific markers. The emergency markers are located every 1/10 of a mile, according to Brinkman. Each marker has a number and a letter noting its direction. Fire Chief Bob Grabowski said the spacing and directional designations are important improvements over the existing trail markers, which are spaced farther apart and might not be close enough to an emergency situation to be of use. 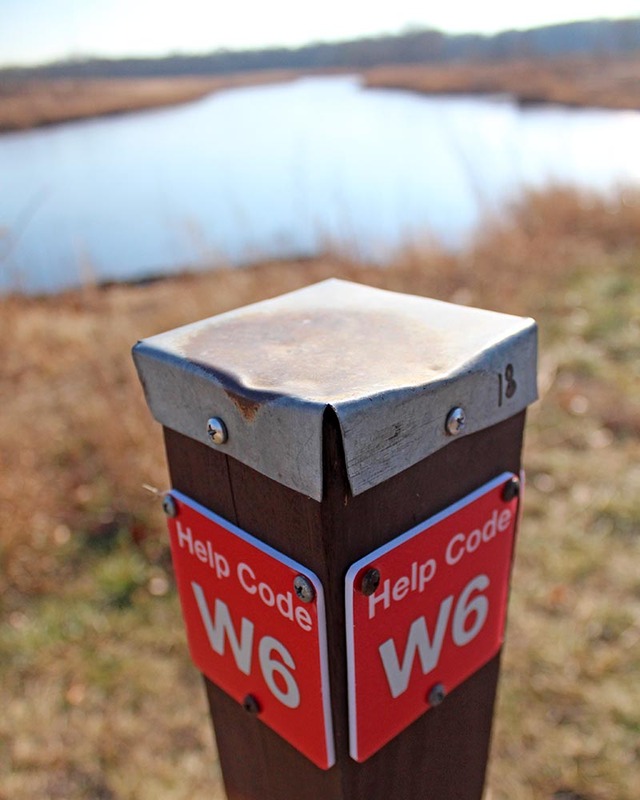 The trail markers are labeled with distances, but since each trail has its own marker system, using them to locate a spot in the preserve could be confusing, he said. Hofeld urged hikers to be sure and find the red markers when calling for help. The old trail markers are not adequate references for first responders. The ECom dispatch center has the map of the markers, and all Homewood police and fire vehicles have access to the map, so 911 callers can report the nearest marker, and that information will help first reponders locate the person requiring assistance. Brinkman said one marker was subsequently installed at the spot Hofeld fell into the water near the Hoffman Way entrance to the preserve. Grabowski said the fire department typically responds to about half a dozen calls in the preserve each year. Most are the result of falls rather than water rescues. Hats off to Riley, Brinkman and the Izaak Walton board, and Homewood police and fire staff for the work they put in on improving safety and emergency response at one of Homewood’s favorite recreation spots. The developments before and since Hofeld’s accident have made Izaak Walton a safer place for people and pets to enjoy the nature in our midst. The addition of the Mayor’s Arctic Dip event, which will help the humane society serve homeless animals, is the icing (sorry) on the cake. A story in the December edition about the 2018 inductions in the Homewood Hall of Fame included incorrect relationships in the Tienstra family. The passage should read: “Joseph’s son, Garrett, started a plumbing business in 1955. Garrett’s son, Gerald, and his grandson, Glenn, have continued the family’s tradition of service.” Thanks to Mary Ann Boggs, who nominated the family for the honor, for providing the correct information.